NY, World Fantasy, ALICE, etc. 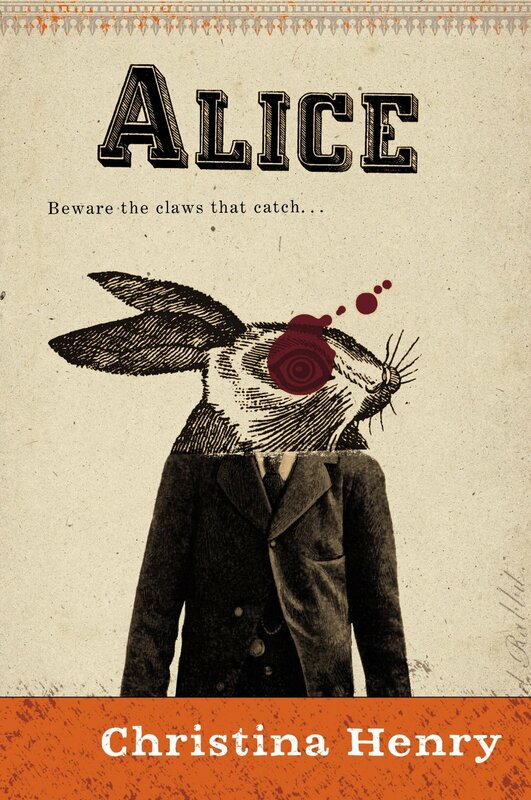 I’m truly excited to announce that ALICE by Christina Henry (that amazing novel I raved about to everyone who would listen) made Amazon’s list of Best Books of the Year: Science Fiction and Fantasy in addition to the semifinal round of the GoodReads Best Books of 2015: Horror! Speaking of great books, I finally read ANCILLARY JUSTICE, the sf novel by Anne Leckie that everyone else has been talking about for so long and which has taken home a host of awards. It took me a while to get into the story, but once the larger implications of things were unveiled, I couldn’t put the book down. Next order of business: pick up ANCILLARY SWORD and ANCILLARY MERCY to (hopefully) read over Thanksgiving. Also, pay this book forward, since it was given to me. 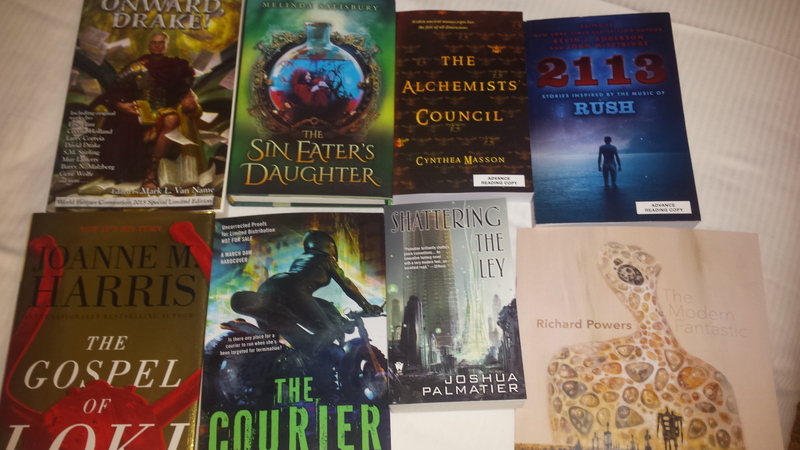 That’s one of the wonderful things about meetings with editors and authors, they have such fantastic taste, and I get to add to my teetering TBR pile. Another great thing, I get to contribute to theirs! Oh, I have mailings going out this week which will hopefully brighten up some holidays. So, I promised a write up of the past week. Again in brief, because…time… It hit the ground running last Tuesday morning (despite one of the wheels falling off on my rollerbag!) for several really productive meetings in New York, followed by dinner with my longtime friend (and former boss) Eleanor Wood, in our old stomping grounds in Chelsea. Sadly, our old watering hole had closed, but the Trattoria was still open and still absolutely wonderful. The next day involved a breakfast meeting where Rebecca Brewer and I got to cheer on Christina Henry’s success, a coffee meeting, a lunch meeting, more coffee…you get the idea. The high point of the day was dinner with Michelle Belanger and Elyria Rose at Bareburger, followed by her Q&A with Damien Echols and her reading at the KGB Bar to celebrate the launch of her first novel, CONSPIRACY OF ANGELS (she’s well known in non-fiction of the occult)! You can see the video we took of the talk here on Michelle’s Facebook page. The World Fantasy Convention has always been one of my favorite, because it’s all pros, all in one place. Everywhere you look are absolutely amazing people and the stunned realization that you belong among them. Okay, there’s always a certain amount of imposter syndrome, but the reality is there you are. In meetings. On panels. Breaking bread with your literary heroes and heroines. Twenty-two years in the business and I still find it little short of amazing. This year I got to meet my newest client James Alan Gardner and to see long-time clients Carol Berg, J. Kathleen Cheney and David Mack. 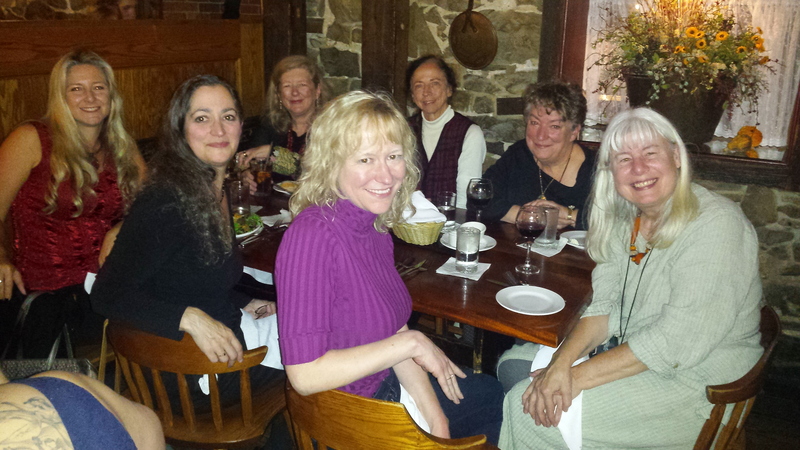 I got to spend time with the brilliant Esther Friesner, Deborah Blake, Ellen Asher, Brenda Carr and Nancy Holzner (see pic here with the aforementioned Carol Berg). I got to share a meal with L.E. Modesitt, Steve Saffel, Dana Hayward, Deanna __ and a new friend we picked up along the way, Ian McKinley, the man in the kilt. I bumped into a lot of people from the Seton Hill Writers Conference, which I’ve been brought in for a couple of times and which is an absolutely fabulous program and to rub elbows with amazing authors F. Paul Wilson, Anne Bishop, Marianne de Pierres, Meg Turville-Heitz and others and to see “rival” (in quotes only because we’re friends, not because they’re not formidable) agents Jennifer Jackson and Michael Curry of the Donald Maass Literary Agency and Barry Goldblatt of his own agency, and editors Diana Gill and Anne Sowards of Penguin, Anne Groell of Del Rey, David Pomerico and Kelly O’Connor of HarperCollins, Marco Palmieri, Whitney Ross and Diana Pho of Tor, Lee Harris of Tor.com, Simon Taylor of Transworld, Oliver Johnson of Hodder Stoughton, Rani Graff of Graff Publishing, Marc Gasgoine and Michael R. Underwood of Angry Robot Books…and OMG, I know I’m forgetting someone and please, please don’t be offended if I inadvertently left you off the list! Anyway, enough of the name dropping. Not so long ago there’d have been a ton of pics as well, but I was so busy I didn’t even think of bringing my camera out most of the time and when I finally did, it decided not to play nice. But I did take a picture of this great haul of books in the conference bag and on the freebie table! I’m looking forward to World Fantasy next year when it’s in Columbus, Ohio, which is where Michelle Belanger’s CONSPIRACY OF ANGELS is set. That’s right, Michelle, you’ll have to go!